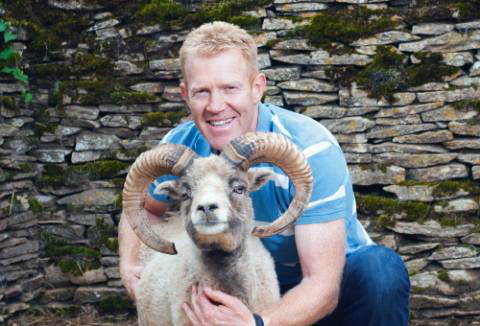 Adam Henson, farmer and television presenter of the popular BBC’s Countryfile program, has a long family association with the sheep on North Ronaldsay. His father Joe Henson MBE was one of the original founders of the Rare Breeds Survival Trust in 1973 and led the Trust’s first major conservation project to help protect this unique rare breed of sheep. The exploration for oil in the northern waters off Orkney in the early 1970’s brought the potential risk of oil spillage to the shores of North Ronaldsay, so the Trust purchased the island of Linga Holm, off Stronsay in the Orkney group, and moved some 200 sheep from North Ronaldsay to provide a reserve flock. Later sheep from Linga Holm were brought to the UK mainland and distributed widely in small flocks kept by enthusiastic conservationists. This proved to be a very wise decision when the UK experienced a widespread epidemic of foot and mouth disease in 2001 and a smaller outbreak in 2007. The island of Linga Holm had served its purpose and was sold by the RBST, so today the only island flock of North Ronaldsay sheep surviving in their original habitat and living almost exclusively on seaweed, remain on the island of North Ronaldsay but face now another, perhaps greater threat, to their future existence. I can and have drystone dyked. I would willingly go to North Ronaldsay for a week in June or October and volunteer my semi skilled services. I could camp. What does the BTCV say about the work on the dyke? Good idea to start a website and charity.